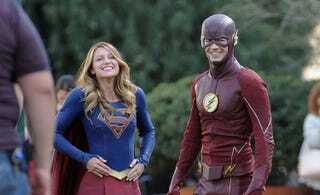 What are the strong points of Supergirl and Flash? There’s several things they do well, but in particular being the bright, optimistic shows should be one of them. The last season for both shows... was not quite that. This last year gave us some good stuff, some bad stuff, and some frustrating stuff. So let’s take a look at what they did right, what they did wrong, and what they need to do to improve. The second part of my CW DC 2016 review is up, covering Flash and Supergirl, over at Kulture Shocked.